While chronicling both Sean's and her journey through terminal cancer, Yates leads others through a poignant personal story that every mother hopes she will never have to tell. While burdened with a mountain of medical red tape, she details how she, her family, and Sean clung to hope, tried alternate therapies, adapted to in-home care, and finally relented to hospice. As fear and stress began to overshadow everything else, Yates reveals how she fervently prayed and received an insightful answer that provided her with an incredible blessing. Through it all, her story illustrates how illness and loss not only demand tremendous advocacy and faith, but also have the power to teach us about ourselves and those we love. “The Gift of More” shares a mother's touching story about courage, faith, and transformation after her adult son is diagnosed with cancer. 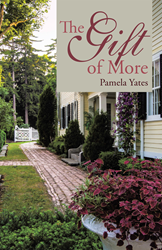 Pamela Yates is an author, feature film producer, marketing and PR specialist, and a public and motivational speaker. She was married to fellow author and screenwriter Brock Yates.